james Cassidy . He was from the bone in Belfast and is pictured in this photo . Two historical figures intrigue me, both from north Galway. you ever come acrcoss her – Eva O’Flaherty – in your research ? come across him either in your research ? Richard Gough from Inchecore Dublin was a volunteer do have any details for me and is there a medal the family are due ? I’m sorry to trouble you, but was wondering whether the organisation would be able to assist me. My Great-grandmother’s (Catherine Flynn) grandfather (William Flynn) was allegedly an Irish Volunteer, Cork brigade and signed up 1914. I was just wondering whether there were any more details available such as his birthdate, parents names and where in Cork he was from? I would be much obliged if you could please give this some consideration and get back to me with any pertinent information. Thank you for taking the time to read my email and I look forward to hearing from you. I was at, and enjoyed, your wonderful display of items in Hayes Hotel, Thurles, last weekend. I was speaking with one of you fine men while you were putting away the displays, as a few items had caught my attention. He asked that I email this email address with my questions, so here goes. I saw on one of the tables a reference to the only Cumann na mBan woman to be killed by the Tans. I think the story was, they called for her brothers, they were not there, so they shot her instead. May I ask, what was the name of this lady, do you have any details on her story by any chance? Also there was another leaflet or news item which referred to two pics of two boys, who were killed, was it in crossfire? I simply cannot recall any details, only that it was a document showing two pics, or two boys, who got killed. Any ideas what this was that I saw? What is the story here I wonder? Well I really hope you can help me. Thanks again for bringing your display to Thurles. I am wondering if you have contact details for someone within the “Third Tipperary Brigade Old IRA Commemoration Committee”. I am trying to research my great grandfather Patrick Cleary. We believe he was involved in the Independence movement but in what capacity we do not know. We do not know anything about what he did and would love to get answers to our questions. I was just wondering if you could possible help me in any way. My Great Grandfarther was a member of the Irish Volunteers and i was wondering how would i gop about finding out any more information about that and if their are any records or such. He was a member of North Kildare 2nd, his name Thomas Mullally, from Athgarvan, Kildare. 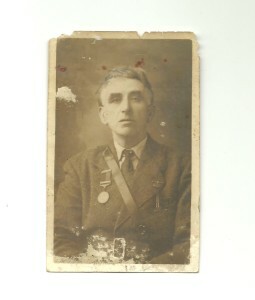 I’m looking for information on John Clarke, born 1896 Dromard, Dromore West, Co. Sligo. Joined the IRB in Boston, returned home to fight in 1921. Allegedly was imprisoned in Mountjoy in 1922 or 23. Would love to know if he was arrested at the same time as Tommy Goff, also of Sligo, who was shot by IFS April 23 1923. Enclosed Pic of Christy Mackey, known in Rush Co Dublin as Kit. He was a member of old IRA North Dublin. His years 1899 to 1979. He remained single and lived with his brothers Paddy and Jim and sister Mary Jo who was Postmistress there for many years. They run a butchery in rush village but Kit or Christy had a greenhouse at the back of their house in the Mall. I did temporary relief at the post office in about 1971 and remained a visitor at Mackey’s for several years. Mary Jo told me that Christy was on the run for a good while. I guess until things got resolved. During my time visiting Christy used have an outside concrete seat which he painted green, white and orange. i never thought to take a photo of it. This pic used hang over his bed. For a time one could get their portrait taken and later get a coloured one. before my last time, I asked Mary Jo if I could get a copy of it because I held a grea affection for him. John Buckley was reared at the Mall and got the dwelling house. I am telling you this in case this pic is not good enough. I found John Buckley to be very agreeable. Message I have got a colour picture of Christopher Mackey, Rush, Co Dublin, in uniform wearing leather belt of republican army. Can you please give me some information on plunkett column picture 1923 the lady sitting front left i belive to be my grand aunt maggie jordan dublin. Were can i get a better pic of the image. He had a brother, Patrick who joined the R.I.C. There most have been so animosity there. A distant cousin took his gun, letter and medal from the family home which he kept and Louis’ immediate family, us, would like them back, do you have a museum or somewhere these could be displayed. Looking forward to hearing anything from you. was givin a cert on that date would it be possible to see it also. Ive been trying to trace a picture of cumann na mban drumcondra branch for long time. 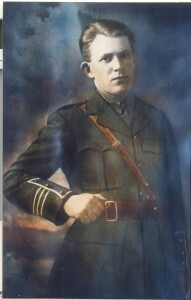 i have a photo of my grandfather Mick Ahern, in Irish Volunteer uniform as first Captain of the Clonakilty Company and can forward it to you if you are interested. Looking for information great uncle Harold Mc Brien SLIGO / DROMAHAIR.LIVED IN BALLINTOGHER. I’m making a documentary about my grandaunt, a revolutionary in 1916, she helped prisoners of war escape from Strangeways following an encounter with Irish soldiers on a train bound for Frongach. I was wondering if you have any Gaelgóirs based in Northern England or Wales who could talk to me about this era. I am an Irish playwright. I am writing a play in commemoration of the 1916 rising centenary and looking for some genuine, personal stories regarding IV’s involved either in Dublin or Galway. I have certain information on a relative of mine, however not enough to construct a truthful/sufficiently fictionalised piece. I will be connecting the story with Irish WWI British soldiers. If you could point me in the direction of some personal war stories, to do with the somewhat unknown men on the ground, I would be much obliged. The stranger the stories and more intricate the familial relationships the better. I realise I’m being rather vague, but I hope you see what I’m after. I would greatly appreciate your help. Subject: Patrick McHugh Munitions 1919 – 1923 I.R.A. Would you have any information on Patrick McHugh, 33 Barrow Street, Ringsend Road, Dublin. I am interested in contacting any of his family as my father worked with him during the War of Independence. Patrick names him in his list of Munitions Staff. If there is a protocol regarding giving out personal information would you pass this note on to any of his family who might be kind enough to respond to me. Go raibh maith agat. I am trying to contact the family of Seán Prendergast O.C. 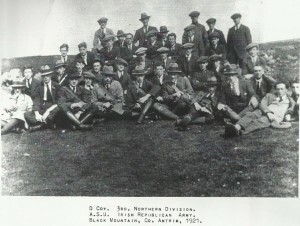 C Company, 1st Battalion, Dublin Brigade. My father Christopher Healy was a member of this unit and worked full time in the Munitions Section as Official Carrier during the War of Independence. I have a copy of his pass for the 4 Courts Courts in 1922. I am interested in finding any information in Seán’s papers about my father. I know his name from my father and also the names Joe Furlong and Dinny Holmes. Tá súil agam go mbeidh tú in ann cabhair a thabairt dom. Hi, I have some family notes that I would really like Liz Gillis, if possible to have a look at, one set some missing unfortunately was written by my grand uncle James Kelly Capt b COY 4th Nth Div and tells some of what happened in Co Louth involving Sean Macentee andSean MacDiarmada etc the other is a copy from his sister Bridget Kelly there is some material I seen previously re Grace gifford. My name is Brendan Murphy and I am self publishing a book on County Kerry, Ireland. The book will feature interesting people, places and events in Co. Kerry. I am doing a feature on Thomas Ashe and the O’Rahilly and I saw your photographs on your website. I would like permission to use the photographs of Thomas Ashe and the O’ Rahilly in my book. On the page the photo appears your name will be acknowledged as photographer and at the back of the book web site info etc will be given. Any help or photos appreciated. Hi, would you be able to help me? 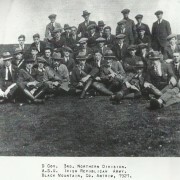 I’m trying to find details on Cumann Na Mban, 7th Battalion, Ballingarry Branch. In particular, I am trying to trace a member called Annie Norris. She later married a man called Thomas Berry. Any help would be greatly appreciated. Message my father in law served with Sean Tracey and Dan Breen he is mentioned in Breen’s book My fight for Irish freedom chapter 4 I am looking for any further confirmation as to his service, he was born 25th Aug 1895 in Doon Co Limerick. any information would be gratefully received as I am trying to complete a family biography. thank you. enjoying your articles and photographs. my great grandfather was in skibereen from 1911, and was then in curragh camp taking photos.. don’t have much information, just saw some photos he took of rebels with weapons and ammunition in the curragh. I was wonder where i could find information about my grandfather who was part of Donegal South Brigade, fourth battalion. I believe that my nans dad was seamus Kavanagh. Lily or Elizabeth was born in 1917 (we don`t know her name) What my nan told me when I was 14 yrs old. Her dad was in a line to be shot, then a person from the other side who knew him, decided to give him a chance and let him `run`. He had a family, but I don`t think we were from that 2nd family from what I have read. I have seen the son (Dundalk museum) in a photo and he is the image of my nan. I’m looking for any information you might have on a volunteer listed as Thomas Canty or Casty. It’s my belief that this is in fact my great grandfather Thomas Heeley. What do I know? : I know that he was garrisoned at Marrowbone Lane Distillery and that there is also very little information relating to him. I have read through the records submitted by some of the combatants at Marrowbone Land Distillery and the South Dublin Union to the Bureau of Irish Military History and there is no mention of him either. There is also no mention of him being at Frongoch or even on the Dublin Census of 1911 although there is a Canty family living at 28.1 Marrowbone Lane at the time of the Rising. The only Thomas Cantys I can find on the 1911 census are living in Kerry or Cork. It would strike me as being strange for a Kerry/Cork volunteer to come to Dublin to partake in the rising, but be stationed at an outpost. It is however possible that one of these country Cantys might have been related to the said Canty family on Marrowbone Lane at the time, but I find it unlikely. There also seems to be considerable doubt over the correct surname for this volunteer. Why? : It’s my belief that this Thomas Canty or Casty was in fact my great grandfather Thomas Heeley who lived at 99.1 Cork Street at the time, which is/was only a 5 minute walk from the voluteer garrison. His Father and step brothers and sister were English born and his Irish born brother (James) was a chauffeur for British generals on the Somme at the time of the Rising. I believe that he used a variation or pseudonym of his Irish born mother’s surname (Cantwell) in order to protect the family name Heeley. I also think he got away before the official surrender of the volunteers of Marrowbone Lane as it has been recorded that Con Colbert stated that anyone not in uniform should try and escape. Eventually Ceantt on hearing this stopped it, but some of the combatants had already got away. Marrowbone Lane as it has been recorded that Con Colbert stated that anyone not in uniform should try and escape. Eventually Ceantt on hearing this stopped it, but some of the combatants had already got away. I’d also like to note that Thomas and his brother James were Irish-born as was there mother and felt closer to her than their English-born father. There was a massive divide in the family due to father (Robert), the step-brothers and sister being English. The step-brothers and sisters actually moved back to England at some stage between the 1901 and 1911 censuses. Any insight or info you can give me on this Thomas Canty or Casty would be much appreciated. With regard to the above post has the person used the 1901/1911 census records. If they would like some assistance in a non professional capacity I have a fairly good grasp of Irish Geneological resourses and would try to assist if possible. You are welcome to pass on my email address to the person should you wish to. I am of the understanding that my Great Grandfather William Ronan is in this photo hosted on your website. But I am unsure which person is him. I would be obliged if you could identify him and if you happened to have any other photos containing him? your site contains a photograph – Cork Volunteers. I would like , if possible, to get a copy of the photo with Sean O’ Sullivan seated with a group of other Cork Volunteers. He is my Grandmothers Brother……. I’m currently researching a short script on the 1916 Pirate Radio Broadcast and am just wondering if you would know if any of the original pirates still have any relatives around that I could contact, mainly Fergus O’Kelly, Liam Breen, Arthur Shields, Joseph Mary Plunkett, Tom Weafer, The O’Rahilly or John O’Connor? father was a member during the War of Independence and the Civil War.
. In research I found that my father’s cousin Seán McGrath was fatally shot in Ballyconnell in Feb. 1923. He had written in Irish to my father in Jan. ’23 and described the law-lesness in Ballyconnell.This incident was widely reported in Nat. Newspapers and provincial. The Minister made several statements in the Dáil about the incident;and it was debated on the 8th.+9th. of Feb.by TD’s. It was sent from Belfast to the ‘Daily Express’ paper in London. Seán was only 23 years.He and my father were both Irish teachers both having attended Coláiste Chonnacht, Tourmakeady. My father in 1908 and Seán in c. 1918 (2 terms).This incident was described as ‘The Tragedies of Ballyconnell’. I have regularly read Irish Volunteers, which is extremely interesting. but NOTHING is ever mentioned about my cousin, (My dads first cousin they grew up together in Howth) George Gilmore. yet he was very involved in the troubles in Dublin and I think Cork, and the Spanish Civil War. Could you please tell me why he is never mentioned. and I would love to know what he was like as a person other than just the political person a lot is written about. I remember meeting him a couple of times when I was very young, and visiting his very odd cottage in Howth. Also why his mother my Great Aunt went to prison. I have never been able to find the reason for her imprisonment. Please Please please give me some answers. Just found out that my grandfather George Victory and a great-uncle Michael Bridgeman were Irish Volunteers. I have been told that Michael was in Frongoch and was wondering do you have a list or do you know where I might get a list of volunteers who survived. my father Michael mc Donald r i p was a volunteer in the I R A in belturbet co cavan in 1912 , he had some bravery medals now lost would love to get some informatin on his time in the I R A, he also got a pension .How do i go about getting infor mation on him. All help much appreciated. Thank you for this. My uncle, Tom O’Toole, pretty sure, is my late Dad’s eldest brother who got out to the U.S. (had to?). Years later I met his son Tom and his son also Tom, in Calif. 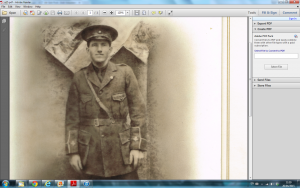 I searching for information on my great uncle Michael Roe who lived in Dalkey and received a volunteer medal. He fled Ireland after the Irish Civil War because he was a nationalist, He lived in Canada but never spoke of his war experience. Family info is he was with the Dublin Brigade. I have just this am come across a newspaper cutting showing the daughter of Arthur Griffith RIP whom I understand died in 2006. I would greatly appreciate it if you could forward this email to a member of the Mrs. Ita Gray’s (Nee Griffith) family so that I can arrange to send them this cutting if they wish me to do so. I would appreciate a confirmation that you have the contact details for the Griffith family. This is to Certify that Harry Lea served in the War of Independence against the British Forces. I am trying to gather more information about my Grandfather’s role in the 1916 Uprising (he was born in 1903) and the subsequent Civil War. any help in this regard would be most gratefully appreciated. Subject: Volunteers that emigrated to U. S.
I am interested in any information you may have regarding any Irish Volunteers that emigrated to America and/or joined activism in organizations there. I am hoping to write a series of commentary on men and women who did that. I include my resume. Any information that you may have to share particularly in what I refer to as the American Shamrock …Boston, NY, Philadelphia and Chicago would enable me to hopefully tell their story during the centennial. If you have any questions, please do not hesitate to contact me. Michael J. Cummings, a native of Springfield, Mass., is a graduate of St. Anselm’s College (B. A., 1968) and New York University (M. P. A., 1970). A former member of the National Boards of the Irish American Unity Conference (1996-2013), the Ancient Order Hibernians National Board (2001-2008), and the National Executive of the Irish Northern Aid Committee (1988-1996), he served six National AOH Presidents , 5 IAUC National Presidents and two National Chairman of INA primarily in public relations capacities. He is the only person to serve on the national policymaking bodies of all three major Irish American organizations. He also served on the Commission on Peace and Justice of the Roman Catholic Diocese of Albany. Cummings has appeared on American, English and Irish television and radio and his commentary and letters and those of the Presidents have appeared in major American, Irish-American, and Catholic print media. He is a frequent columnist for the weekly IRISH ECHO newspaper. He has been married to Nuala Hogan, a nurse and native of Ireland, for 41 years and resides in Albany, New York . They are the parents of five children and two grandchildren.